Exeter winger James Short says he is impressed with the team spirit he has encountered since joining the club. The 25-year-old signed a one-year deal in July after leaving London Irish. 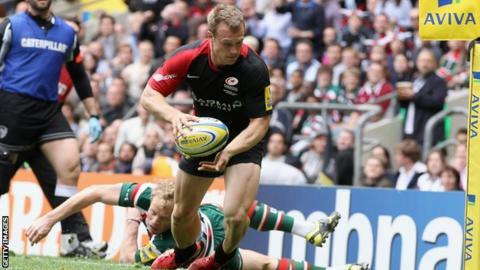 Short won the title in 2011 with Saracens, scoring the only try in their Premiership final win over Leicester. "It's a tight-knit group and a bunch of lads that are willing to play for each other as opposed to everyone off on their own tangent trying to make themselves progress," he said. Short, who has also spent time at Wasps, says he is excited to have the chance to play at Sandy Park. "I've been at four different teams in the Premiership and I've got a bit of a feel for each different one and this really feels like it has a good culture and one that players can buy into," he added. "It feels like here everyone's playing for Exeter, the team and the surrounding area, and it's away from everyone else and it's got its own little culture. "It takes a while to build that environment, it doesn't just happen overnight and I've come her over the past month and seen that it's already here." The Chiefs just missed out on a place in the play-offs last season, pipped by Short's former club Saracens for fourth place on score difference having finished level on points. "We have to be better than we were last year," Short told BBC Sport. "Last year we were fifth, let's get into that top-four spot and challenge for the Premiership title. "With Sarries it took a couple of years to get there, Exeter have come up form the Championship so it might take a bit longer. "It's gradually building and trying to improve on what you're done in previous years and just taking steps forwards, whatever the steps are." Read more on Allan McNish: How messy could Red Bull’s divorce be?